Small volumes of anti-KCNMB3 antibody vial(s) may occasionally become entrapped in the seal of the product vial during shipment and storage. If necessary, briefly centrifuge the vial on a tabletop centrifuge to dislodge any liquid in the container`s cap. Certain products may require to ship with dry ice and additional dry ice fee may apply. Background Info: Detects ~32 kDa. No cross-reactivity against BKBeta1, BKBeta2, BKBeta3b or BKBeta4. Scientific Background: BK channels contribute to electrical impulses, proper signal transmission of information and regulation of neurotransmitter release (3). A gain of function mutation in the pore-forming alpha subunit of the BK channel was linked to human neurological diseases. Findings suggest that the distribution of the beta subunits in the brain can modulate the BK channels to contribute to the pathophysiology of epilepsy and dyskinesia (4). This has major implications on other physiological processes in tissues other than the brain. 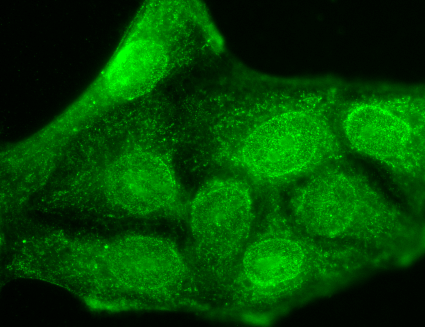 Immunocytochemistry/Immunofluorescence analysis using Mouse Anti-KCNMB3 Potassium Channel Monoclonal Antibody, Clone S40B-18. Tissue: HaCaT cells. Species: Human. Fixation: Cold 100% methanol for 10 minutes at -20 degree C. Primary Antibody: Mouse Anti-KCNMB3 Potassium Channel Monoclonal Antibody at 1:100 for 1 hour at RT. Secondary Antibody: FITC Goat Anti-Mouse (green) at 1:50 for 1 hour at RT. Localization: Accumulation at the edges of the cell, ruffling edges. Western Blot analysis of Rat brain membrane lysate showing detection of KCNMB3 Potassium Channel protein using Mouse Anti-KCNMB3 Potassium Channel Monoclonal Antibody, Clone S40B-18. Load: 15 ug. Block: 1.5% BSA for 30 minutes at RT. Primary Antibody: Mouse Anti-KCNMB3 Potassium Channel Monoclonal Antibody at 1:1000 for 2 hours at RT. Secondary Antibody: Sheep Anti-Mouse IgG: HRP for 1 hour at RT. Immunohistochemistry analysis using Mouse Anti-KCNMB3 Potassium Channel Monoclonal Antibody, Clone S40B-18. Tissue: backskin. Species: Mouse. Fixation: Bouin's Fixative and paraffin-embedded. Primary Antibody: Mouse Anti-KCNMB3 Potassium Channel Monoclonal Antibody at 1:100 for 1 hour at RT. Secondary Antibody: FITC Goat Anti-Mouse (green) at 1:50 for 1 hour at RT. 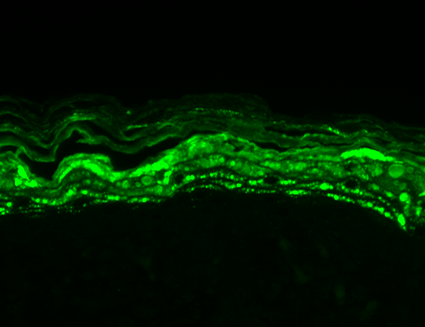 Localization: Beautiful filaggrin-like staining. NCBI/Uniprot data below describe general gene information for KCNMB3. It may not necessarily be applicable to this product. KCNMB3: Regulatory subunit of the calcium activated potassium KCNMA1 (maxiK) channel. Modulates the calcium sensitivity and gating kinetics of KCNMA1, thereby contributing to KCNMA1 channel diversity. Alters the functional properties of the current expressed by the KCNMA1 channel. Isoform 2, isoform 3 and isoform 4 partially inactivate the current of KCNBMA. Isoform 4 induces a fast and incomplete inactivation of KCNMA1 channel that is detectable only at large depolarizations. In contrast, isoform 1 does not induce detectable inactivation of KCNMA1. Two or more subunits of KCNMB3 are required to block the KCNMA1 tetramer. Belongs to the KCNMB (TC 8.A.14.1) family. KCNMB3 subfamily. 4 isoforms of the human protein are produced by alternative splicing. 1. Hille B. (2001) Ion Channels of Excitable Membranes, 3rd Ed., Sinauer Associated Inc.: Sunderland, MA USA. 2. www.iochannels.org 3. Wulf-Johansson H., et al. (2009) Brain Res. 1292: 1- 13. 4. Lee U.S., and Cui J. (2009) J Physiol. 587(7): 1481- 1489. 1. Report beta subunit (KNMB1-4)-specific modulations of BK channel function by a Slo1 mutation associated with epilepsy and dyskinesia.